Using a fork, mix the eggs, milk, cream and butter together in a heatproof bowl. Season with salt and stir to combine. Place the bowl over a pan of simmering water and allow to cook really slowly using a spatula to continuously stir the mixture. Cook until the eggs begin to scramble – this should take 15–20 minutes. 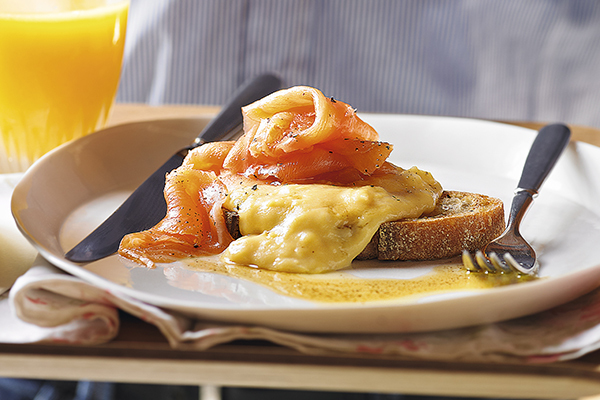 To serve, place the scrambled egg on your favourite toast, top with Heston’s Tea Smoked Salmon then season with the acidulated beurre noisette (see tip below).